This is a perfect broadcast direct TRF receiver. 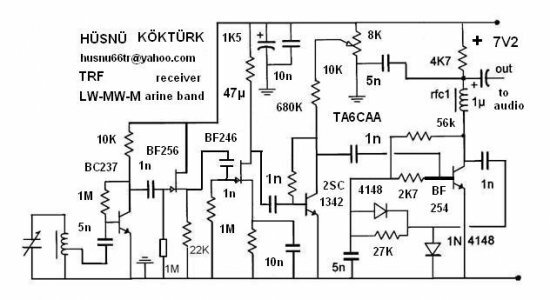 It is designed for the detection of AM signals in the 150kHz to 3MHz. 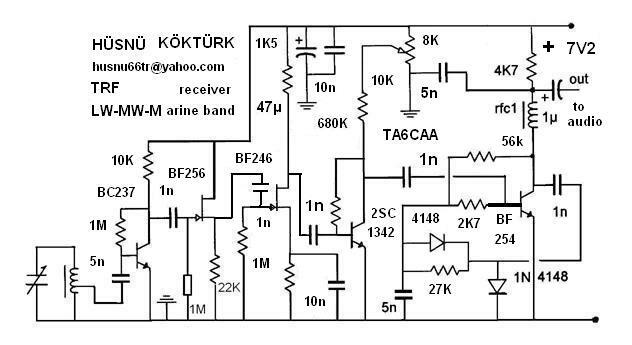 This circuit features good sensitivity, selectivity and high audio output level. Especially gives high and quality sound.You can put a small rfc choke to the enter of the receiver for erasing parasitic FM signals. Perfect for LW and MW but for short wave I can't say perfect. Better than all superheterodiyn receivers unless is made for special. If needs more sensitivity adjust the pot For More sensitivity the middle of the coil point must be between 3-10 turn, not much. (3-5) turn for MW 3-7 turn for LW). Some value of the emitter resistance of the transistor is very high, like 27K, 22K, 10K, These are not the wrong values. Put the ferrite bar to a safely place. Don't put the coil on the speaker or to a anti feedback, dead place. This receiver convenient for listening Dx stations. This version of this receiver will work very okey with air cored inductors, 11cm diameter, 100 turn for LW and 35 turn for MW. No external antenna needed.